The University will be celebrating the mission change and name change anniversaries with a barbecue from 11:30 a.m. to 1 p.m. June 29 on the mall. David Nichols, Randy Smith and Jay Bulen will provide music during the barbecue. The rain site will be the Student Union Building Quiet Lounge. Cost is $4 in advance and $5 the day of the picnic. R.S.V.P. to the Public Relations Office by June 27 at 785.4016. Ten years ago on July 1, 1996, legislation went into effect that changed the University’s name to Truman State University. Twenty years ago on Jan. 1, 1986, legislation went into effect that changed the University mission from a regional university to a statewide public liberal arts and science university. Additionally, there is an exhibit “Normal to Truman: A 10th Anniversary Celebration of Our Name Change” currently on display in the Pickler Memorial Library gallery. The exhibit will be on display until July 1. It covers all the name changes in Truman’s history and a few of the events of note that occurred under each name, including the transition from a private to a state school, the mission change, the Mitau Award, the “firsts” (first Index, first yearbook), and more. For more information about this exhibit, contact Elaine M. Doak at 785.7368. The German Academic Exchange Service (DAAD) has selected Michelle Begue, a German major from Springfield, Ill., as one of its 2006-2007 undergraduate scholarship winners. Sixty-two undergraduate students from 51 different Canadian and U.S. universities were selected by a panel of experts in higher education to receive a prestigious scholarship to study in Germany. This year’s scholarship recipients were selected from a group of 210 applicants from the United States and Canada. Most will head to Germany this fall. The Undergraduate Scholarship Program is aimed at students who want to spend part of their third or fourth year of college in Germany. The grantees stay anywhere from a semester to a full academic year, either to study, for internships, or senior thesis research. The Taiwan at Truman program is in need of host families for a one-weekend homestay with local families during the weekend of July 7-9. Thirty-one high school girls from Taiwan will be participating in the program from June 12 to July 17. The girls prefer to be placed two to a home during the homestay because some speak better English than others. Some of the older girls could be placed one to a home. Contact Shelley Begue at mnb314@truman.edu for more information or to volunteer. The Public Relations Office is looking for volunteers to work the gate July 17 for Truman Day at the NEMO Fair. Shifts are from 6 a.m. to 6 p.m. and last for three hours each. Call 785.4016 or stop by the Public Relations Office in McClain Hall 101 to sign up. Hours will vary for holidays and breaks. For evening or weekend events, please contact the SUB Office at 785.4186. Call for an appointment at 785.4484. Jazzman’s and Freshens have relocated to the main concourse of the Student Union in preparation for the upcoming renovation. Please a bring a form of identification. 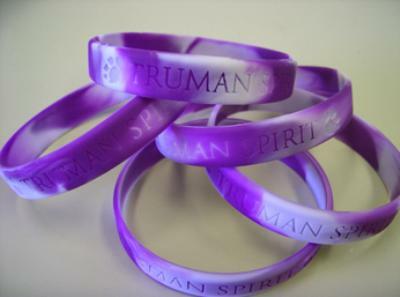 Truman’s Staff Council Spirit Committee is selling Truman Spirit wristbands for $1 each. The purple and white wristbands can be purchased from Kimberly Titus in the Registrar’s Office, McClain Hall 104, or from Katie Best in the Public Relations Office, McClain Hall 101. Proceeds will go toward future Truman related spirit functions. John Ishiyama, professor of political science and director of the Ronald E. McNair program, had his article “Globalization, Political Institutions and Ethnic Assertiveness: An Empirical Study of 32 Developing Countries” published in the latest issue of the journal Ethnopolitics. Daniel Mandell, associate professor of history, had an article, “The Times are Exceedingly Altered”: The Revolution and Southern New England Indians,” recently published in Eighteenth Century Native Communities of Southern New England in the Colonial Context, eds. Jack Campisi, “Mashantucket Pequot Museum and Research Center, Occasional Paper No. 1” (Ledyard, Conn.: Mashantucket Pequot Museum and Research Center, 2005). The Cashier Window will be closed from noon to 1:15 p.m. June 20-23. The next issue of the Truman Today will be published July 3. Submissions for this issue are due by June 28 to kbest@truman.edu. The Truman Today is published biweekly during the summer session. Pickler Memorial Library is now accepting donations for a book sale to take place in September. Donations of used books, magazines, art prints and audio and video recordings will be accepted. For details visit the library’s Web site at http://library.truman.edu/booksale.htm or call 785.4038.